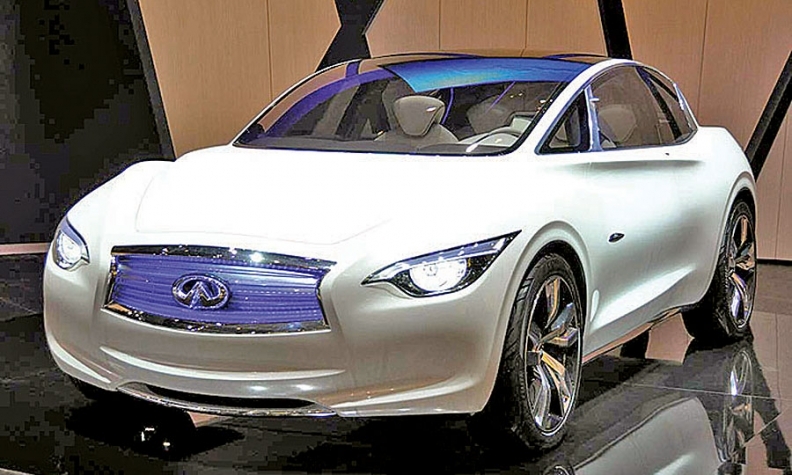 The Etherea concept (shown) previews Infiniti's new entry-level model. Infiniti has scaled down its ambitions for Europe in the wake of the region's economic slump. Nissan's luxury brand will likely take longer than 2016 to meet its goal of 100,000 annual vehicle sales in Europe, Infiniti President Johan de Nysschen said. The target stills stands but Infiniti will likely not meet the timeline that was originally set, he said. "There is not a line in the sand that says we have to achieve those volumes by a certain time. We have to meet our volume sales targets in a sensible way," de Nysschen told Automotive News Europe. Renault-Nissan CEO Carlo Ghosn had set a target for Infiniti to boost annual sales in Europe, including Turkey and Russia, to 100,000 vehicles by 2016 from 12,500 last year. The goal was part of Ghosn's ambition to triple Infiniti's global sales to 500,000 units by 2016 from 146,000 last year. Earlier this month Infiniti said it would build its new premium compact hatchback in the UK. Production of the luxury brand's entry model will begin in 2015 for global markets at Nissan's plant in Sunderland, England, Infiniti said. Nissan will invest about 250 million pounds ($405 million) in the plant to expand capacity to produce 60,000 Infiniti models a year. The compact will share the same underpinnings as the Mercedes A- and B-class models as part of a two-year-old strategic cooperation between Renault-Nissan and Mercedes-Benz parent Daimler. De Nysschen acknowledged that Infiniti faces a tough task winning sales from German premium brands, but said: "There is room for a strong fourth player and that strong fourth player will be Infiniti." De Nysschen, who led Audi in North America before becoming head of Infiniti in July, knows how to turn a premium brand into a winner in a market where it has small sales. During his tenure as Audi of America president, Audi's share of the U.S. luxury market climbed to 9.5 percent last year from 5.3 percent in 2004. De Nysschen said Infiniti's immediate goal is to increase brand awareness in Europe by expanding its product lineup, rather than chasing volume. "If we start with the focus on volumes and behave as if we are a mainstream brand and as if success is based on sales quotas, then you do not pay enough attention to building the brand," he said.